There is no doubt that repairing a lock is the much more cost-effective option for any homeowner, but sometimes the only option available to homeowners is changing locks. A lock can be repaired if none of its integral components have been damaged. Our locksmiths will not be able to give you an answer on whether your lock can be repaired until they have arrived to examine the lock and assess exactly what is wrong with it. Essentially your lock cannot be repaired if it is damaged beyond repair. Sometimes locks can be damaged due to blunt external force being used against them (if someone attempts to break down your door) or their internal parts are simply worn from being used so much. This tends to happen with high traffic doors. If any of these things are plaguing your door then it is very likely that changing locks will help solve the problem. With the help of an experienced locksmith, changing locks should take approximately 20 to 30 minutes. In some cases it might take less time or more time, but this is all dependent on the type of lock you already had in place, and the one that you wish to replace it with. The turnaround time is much faster if you are using the same model of lock since your door is already primed for it to be inserted. However, if you are replacing it with a new lock that requires that some minor modifications be made to your door, then it will take a bit more time. In most ideal situations you will not have to change any aspect of your door if you want to replace your traditional lock with a smart lock. Many of the smart lock models fit well within the doors that homeowners have in place. Our locksmith technician might have to make a few minor adjustments to your door to accommodate the smart lock you want to put in place, but you will not have to change your entire door, unless you want to. If you believe that the lock has suffered any damage, or that it is not functioning the way it should, you should contact us to have a locksmith assess the lock for you. In the event that they discover something wrong with it then you should be able to replace it. Regularly scheduled maintenance and simply paying attention to your lock are some of the best ways to know that it is currently time to change your lock. It is important to make sure that your door is functioning the way it is intended to. One of the best ways to do this is to make sure that the locks within your door are working properly and that they are providing the absolute best security to you and your family. One of the best ways to ensure that your lock is always performing the way it should, is to simply pay attention to it. Make sure that you have a professional locksmith come and assess it as soon as you think there might be something wrong. This cannot be overstressed. Having a locksmith take a look at your lock when it begins to malfunction is one of the easiest ways for a homeowner to save money. Some homeowners choose to neglect the early warning signs and continue to use their doors with worn out or impaired locks, until they cause some much greater and far more expensive damage. There are many factors that contribute to homeowners needing to replace their locks. They need to be attentive for these warning signs that could save their lives and save them lots of money in the long run. If the lock of your door has worn out and locks have rusted, then the security of your home is at risk. Locks that are worn are more susceptible to picking, breaking, and they even begin to show signs of difficulty when you attempt to use the proper key to open them. If your lock is struggling to open with the appropriate key (especially on cold nights) you need to replace or service the lock immediately. This will help you to avoid an inconvenient malfunction that may leave you locked out. If you have recently been a victim of a break-in or a robbery, then you should definitely look to replace the locks on the doors of your home. This is one of the most blatant warning signs for homeowners. It is indicative of two things, the first being that your locks were not strong enough to stop a burglar if they were able to bypass them without damaging them. Secondly, your locks are now probably damaged if said burglar gained access by forcing your locks open. The necessary force that is required to forcibly open a lock compromises the internal mechanics and, more often than not, it damages the lock. A damaged lock will put you at a higher risk of another robbery, and mechanical failures as a result of the damage can cause a lock malfunction that could leave you locked out in the cold. After a break-in, it is safest to assume that your keys might have fallen into the wrong hands, and replace all door locks at which the old keys might give someone access to your home. Also, if you happen to be a homeowner that is guilty of constantly losing their keys, then you should look into changing locks on your home with smart locks that make use of combinations and pin pads. Some of these smart locks and combination locks work well to save homeowners money. Many of them still have keyed portions that allow you to open the door the traditional way if you happen to forget the combination or the PIN number. These locks also give you the option to potentially change your combination number whenever you feel that the lock has been compromised, whereas you would have to rekey the lock multiple times if it were a traditional lock. Replacing locks can be a complicated job for those that have never had any experience with it. However, rest assured that our locksmiths are more than capable to handle these replacements for you. Upon arrival to your home, our residential locksmith will examine your lock to identify and confirm that the lock needs to be replaced. Once our locksmith has made this determination, the next step will involve examining the old lock to see what brand it is. This is a necessary action that will save our locksmith loads of hassle while they attempt to replace your lock. Some homeowners want exact replacements of their locks, while others want to change the nature of their locks entirely. The locksmith needs to know the brand and make of the previous lock to help make sure that the new lock they are attempting to install fits perfectly into your door and functions the way it is supposed to. This will also give them the chance to make any minor adjustments that need to be made so that your lock and your door work perfectly together. The next step in the lock replacement process involves the removal of the old lock to make way for the new one. To an experienced locksmith, the act of removing a lock is not hard at all, and it is close to second nature for them. The process begins by unscrewing the plate on the interior section of the door, which will allow you to pull out the doorknobs on each side. Once these have been removed, the metal face plate and latch mechanism that rest within the narrow face of the door can be removed by unscrewing the two small screws that hold them together (located on the side of the door). This allows you to pull out the latch mechanism that was in place. Next, the locksmith will focus on removing the strike plate (the strike plate is the metal plate that surrounds the small hole in the doorframe). Once the old strike plate has been removed, then the new strike plate can be screwed into the door. In some cases, your old strike plate might be the exact same size as the new one you want to install. If this is the case, then there is no need to remove the old strike plate. The next step involves inserting the new (and improved) lock into the section where the old lock and faceplate used to be. It is very easy to make mistakes while carrying out this process, which is why we always admonish that you leave this up to a professional. 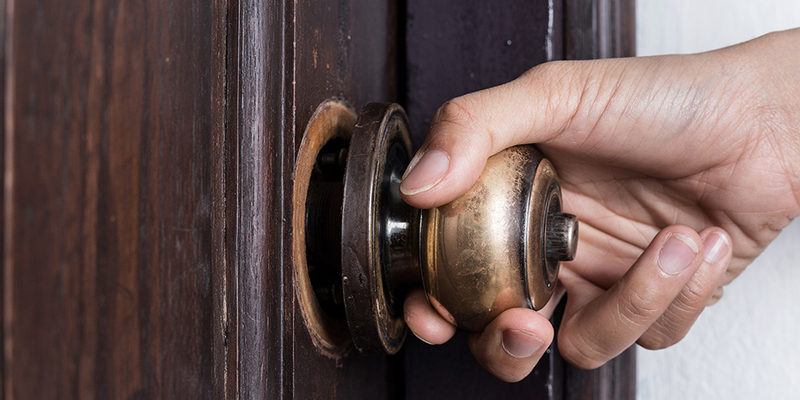 Many homeowners have made the mistake of inserting the new lock the wrong way. They insert the lock the wrong way and this causes a lot of time to be wasted. It is important that the latch is inserted so that the curved edge of the latch follows the motion of a closing door. Once this has been accomplished, the next few steps involve putting the new doorknobs back onto the door. This might seem like an easy enough task, but it becomes rather complicated when a professional locksmith is not handling the lock replacement. The next step involves inserting the metal spindle on the exterior doorknob into the hole of the locking mechanism, this is an easy enough task but people without any experience on how to do this might end up damaging their locks. Once the spindle and the exterior knob have been inserted then the interior doorknob should be inserted and screwed back into place. 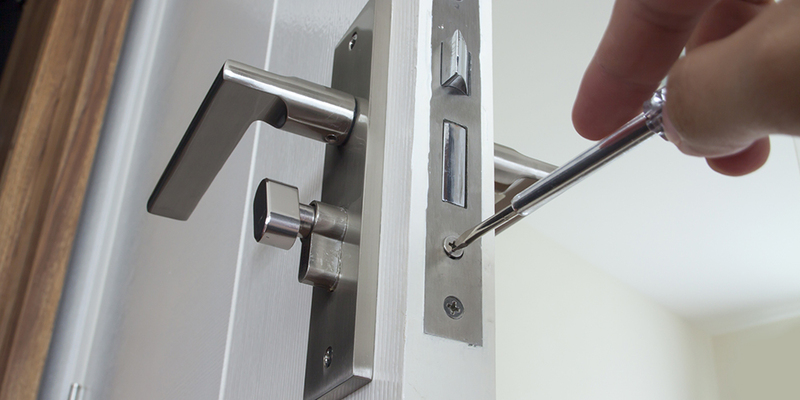 Our locksmith will make sure to give your lock a few test runs to make sure that the lock replacement was successful. After that, you should be good to go. The replacement process for deadbolt locks is similar to the steps that are followed when changing locks on a door that utilizes doorknobs. The first step is to remove the exterior faceplate so that you can gain access to the deadbolt lock inside. Similar to the sequences used in changing locks on doorknobs, you have to remove the all components of the lock from the door. Then proceed to clean out the vacant section to make sure that is free from debris. It is important to make sure that nothing is obstructing the hole so that your new deadbolt lock can work properly. This is a necessary action to take, especially if your old lock was damaged by the use of brute force. It is the best time to examine the door and see if it will still be compatible with the lock you are attempting to install. It is hard to gauge the extent of damage while the old lock is still in the door. After completing this, it is important to load the new deadbolt lock back into the door. Make sure that it is loaded the right way, which means that the deadbolt will be facing up. Once this has been done, the exterior and interior cylinders of the lock should be inserted into the deadbolt. It is important that this is done one after the other, or else you will end up wasting precious time trying to understand why changing locks are so difficult, but the truth is they’re not. The final step is to line the lock up properly and screw everything back into place and check to see if the lock is functioning properly. Easy as that!